I have a student. Well, I have many students. But this one in particular, he is the inspiration for this post today. He is, what I would call, a stereotypical little boy. First of all, he, and his two brothers, are just adorable (I happen to teach all three). They like video games and comic books (and if they don’t, they probably will), and jedi and pirates, etc. Sometimes they are at each others’ necks, sometimes they are the cutest little trio. They are the kind of little boys you might expect to come in with a skinned knee, or perhaps a frog in their pocket (their mom will probably read this, she will have to let me know if there’s ever been a frog situation). This one brother, however, is the kind of guy who makes a mountain out of a mole hill. He has been this way for a long time, and it’s something his mom has told me about, and something he and I have been working on. He has gotten much better at letting the little mistakes stay little. We haven’t really had a crisis in the middle of a lesson for awhile. Yesterday, though, I could see it coming. It was just the way he scrunched up his face, for just a second. And then there was a sniffle. We were on the brink. One more mistake and we might have had a situation. So I stopped him immediately, and launched into it. I wish I could have recorded myself saying it, because I worded it perfectly for him. And they were important enough words that I wanted to share them with all of my students, and with the world in general. Here we go. Dude, dude, dude! Take a breath, dude! This is not a big deal. Let me tell you something. Everybody, every student, every musician, who has ever lived, has been to the place where you are right now. You are on the edge of the map. Sometimes this happens a day after you have your first lesson, or a week, or a month, or a year, or ten years. Everything comes so super easy for you, and then all of a sudden, it doesn’t anymore. All of a sudden, it’s not fun anymore. It’s work. This isn’t a problem, this is just the edge of your comfort zone. NOW is when you begin your journey as a musician. Now is when the adventure starts, and the fun begins. Sometimes the challenges and problems that come up are exactly what make music interesting! Where would the pirates be if they hadn’t committed mutiny, left Captain Jack on the island, stolen the cursed treasure and became zombies?? THERE WOULD HAVE BEEN NO MOVIE! Look at how exciting it was. Sometimes adventures are tough but they can be crazy exciting, too. Right now you are just at the edge of the map. Your adventure is just beginning. Don’t be afraid of it. Don’t be afraid of mistakes. Mistakes just make the day more interesting. Let’s get the pirate ducky out to remind us of the adventure that we’re on. And Adventure Ducky sat on top of the piano for the rest of one of the best lessons I taught this week. I think everyone needs a little visit from the Adventure Ducky every now and again. 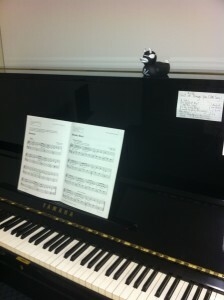 Share the post "The Adventure Ducky Strikes Again"